This is what we had for tea last night. 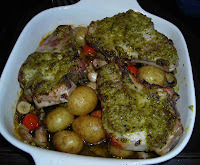 I was out at a needlefelting class all day, so left DH to cook this dish - I love Pesto! 1. Preheat the oven to 190C/Fan170C/Gas Mark 5. Place the potatoes in a large oven proof idsh; add half the oil. Toss to coat. Roast for 20 minutes. 2. Add the mushrooms and tomatoes; gently toss together. Lay the chops on top; season well with salt and black pepper. 3. Mix together the remaining oil and the pesto sauce. Drizzle over the chops and vegetables. 4. Roast for 20-25 m inutes until the chops are cooked through adn the potatoes are tender. If baby new potatoes are not available, use larger potatoes peeled and cut into chunks. 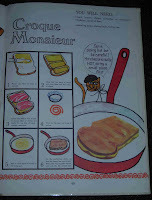 This is probably my favourite recipe, I was fascinated by all things French and this pan fried sandwich seems so exotic. Another recipe which seemed strange and difficult, remember we only had tiny iceboxes in our fridges in the 60's and 70's, so icecream was a real treat. I have made Baked Alaska but always find it a bit of a disappointment. This is one of my favourite illustrations, the book is full of these gorgeous paintings by Martin Mayhew. 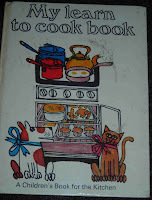 Here is my first cookbook, given to me by my great-aunt Kate. It was published in 1967 and it couldn't have been much after that she gave it to me for Christmas. It has the most fantastic illustrations and interesting recipes. I'm not saying I made many of them at the time, but it certainly sparked my love of cookery books and the feeling that reading them was just as pleasurable as cooking and eating the food. I've just joined 'The Cooks Journal' Forum so I think I had better start using my What's cookin' blog a bit more regularly. So what have I been cooking? We had Chilli Con Carne tonight, just a basic beef mince, tomato, chilli and kidney beans, served with brown rice and cauliflower. 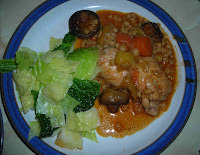 It was quite a rich sauce, probably because I included some passata I had left over as well as the tin of tomatoes. Last night we had a lovely butternut squash and butterbean gratin which had brown breadcrumbs, chopped walnuts and rosemary for the topping, it was delish! I also made an apple crumble but cheated and used packet crumble mix! These are really easy to make, absolutely lethal on the waistline and a firm favourite with children and husbands. 'fraid the ingredients are in lb and oz as these come from my old notebook of recipes, you can see it has been well used! Mix together in a bowl the coconut, icing sugar and condensed milk. Heat the cooking chocolate over a pan of hot water until a runny considtency. Form the coconut mixture into firm balls, dip into the chocolate and allow to cool on greaseproof paper. Do not lick your fingers until the very last bountie has been made! 1. Put the chocoate and cooking chocolate in a large heatproof bowl with the butter. Stand the bowl over a pan of hot water and stir until chocolate melts. 2. Remove the bowl from the heat. Put the biscuits ina polybag and break them up with a rolling pin until in small chunks. 3. Stir into the chocolate with the raisin, hazelnuts and cherries. Mix together well. 4. Spoon the mix onto a sheet of foil. Fold Foil tightly round the mixture and squeeze it into a thick log shape. Chill until set hard. 5. To decorate: unwrap log and put on a serving plate. Melt remaining cholate in a bowl over hot water. Spread chocolate over log to cover it completely. mark the cholate with a fork so it looks like bark. Leave it to set. Sift a little icing sugar 'snow' over the log. Add a sprig of holly or other Christmassy decoration. Good news. Lost another pound this week, I am feeling that my clothes fit comfortably again.